Nowhere is the dramatic improvement in the Cuyahoga’s water quality more evident than in the hoards of kayaks and canoes floating on nearly every stretch of the river. Regional planners, park officials and recreational stakeholders are capitalizing on this newly rediscovered paddling resource and working together to put the Cuyahoga River Water Trail on the map. From the flat water of the Scenic Section that is appropriate for beginners and families to the Class V rapids in the Gorge that are suited only to most advanced kayakers, from the wilderness of the headwaters to the industry of the Navigation Channel, the Cuyahoga has something for everyone. Learn about how the Cuyahoga River Water Trail will advance quality of life and economic development in the region. 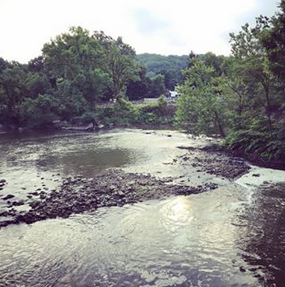 Get a glimpse of how the trail will focus attention on our own iconic Cuyahoga River. It’s been 45 years since the last time the Cuyahoga River caught fire, and 42 years since the Clean Water Act became the law of the land. Explore the Cuyahoga’s remarkable progress toward becoming a fishable, swimmable river. Learn about the heroes and villains in this tale of the struggle for ideas, the big dollar stakes and cutting edge technologies. Find out how improved sewers are transforming water quality. Discover the benefits of clean water investment and the real, although often hidden, cost of pollution-supporting policies. To schedule contact Elaine Marsh (330 )666-4026 or ohgreenway@gmail.com. Elaine Marsh, currently Conservation Director for Friends of the Crooked River, has been active in river issues for nearly 40 years. In 1989, she co-founded Friends of Crooked River, a grassroots group dedicated to the Cuyahoga River. 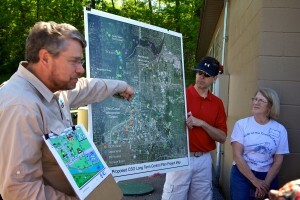 From 1996-2008, she served as Project Director for Ohio Greenways. Elaine sits on many boards and has received numerous recognitions, including 2005 Life Time Achievement Award from Ohio Environmental Council.